Taras Panikorovsky graduated from the Department of Crystallography of the Institute of Earth Sciences of Saint Petersburg State University. 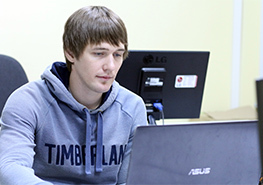 He continues researching at the department and studies crystal chemistry of mineralogical objects of the Kola Peninsula. Taras is a discoverer of several minerals including batagait, selivanovaite, goryainovite, chirvinskiite and others. He is an active participant of mineralogical researches; currently he is involved in development of nomenclature of vesuvian group minerals. The main aim of Taras Panikorovsky’s visit to SCTMS was studying ToposPro, the software package developed by Samara University scientists, which is getting more popular among researchers around the world. The Kola Science Center moves with the times having sent its scientist to SCTMS. Cooperation of SCTMS and the KSC will allow modeling of materials with targeted properties in Samara and performing their synthesis and production on raw material base of the Kola chemical and technological cluster. On November 7, 2018, Taras Panikorovsky made a report reviewing the research work of the Center of Nanomaterials of the KSC on study of natural minerals and their application as prototypes of novel functional materials, as well as prospects for cooperation between the Kola Science Center and Samara University.